Last month in this series on my experiments with unguided meditation, I mentioned wanting to try sitting up during my sessions. Meditation is something I’d previously been doing lying down due to a minor injury that made sitting in certain positions uncomfortable. Click on the link above if you want a refresher on why I chose that goal. Before I jump into today’s post in detail, let’s talk about the chairs in my house and how they’re related to this topic. Technically, both of our chairs are actually meant to be used outdoors. They’re not traditional chairs. Think of camping furniture instead of anything you’d find in a fancy dining room. My spouse and I chose them because they can be folded up and put away when not in use. Since our apartment is a small one, we use the same areas of it for many different activities throughout the week. Anything that can be folded up and put away when not in use is always folded up and put away when we’re finished with it. These chairs work well for most of our purposes, but they’re not designed for someone to sit up straight and meditate in them.Their backs are soft and flexible, and they mold to your body as you shift position. In other words, you’re supposed to sit back and slouch in them. The reason why I went into so much detail about our tiny home and unconventional chair situation is so you could better imagine what meditating while sitting upright is like for me. I had three options when I started doing it a few weeks ago: sit on a chair that encourages slouching; sit on our wood floor; sit on the bed. Due to my sore muscles at the time, I chose option three. It seemed like it would be the least likely one to cause me even more discomfort than I was already feeling. I’m going to be very honest with all of you here. Not all of my meditation sessions have involved sitting up since my last post in this series. In the beginning, that position was simply too uncomfortable on some days. The only way to do it was to lie down. On other days, I waited until so late in the evening to meditate that I was too tired to do so sitting up. The general trend in my life has been towards meditating while sitting up and away from meditating while lying down, though. I expect it to continue in the future as long as I can avoid future injuries. In my experience, meditating works much better in the sitting position. It’s easier for me to stay focused on the task at hand when I’m sitting up straight. There have been a few times in the past when I accidentally fell asleep while meditating lying down due to how relaxed I was on my soft bed. This isn’t something I’ve come close to experiencing while sitting up. There’s also something to be said for creating a routine and sticking to the same environment as much as possible from one session to the next. When I sit in a cross-legged position in my quiet room, I know it’s time to relax and meditate. My body has begun to recognize that this is something I only do during that time of the day since it isn’t how I normally sit. When I was meditating lying down, there wasn’t as much of a difference between that and lying down to go to sleep or to watch a TV show. I like having a sharper contrast between all of those activities. While I’m still in the early stages of this adjustment to my routine, I’m pleased with how it’s working in general. 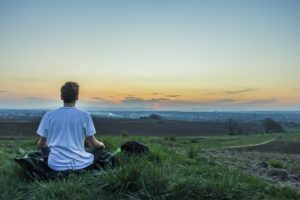 As I mentioned in the previous section of this post, I am planning to meditate sitting up even more often in the future. It was definitely the right decision for me, although I am glad that meditating while lying down worked for me when I wasn’t able to do this position. My goal for the next month is to begin meditating for longer periods of time. My sessions are only about five minutes long right now. This was a time limit I originally set due to the pain and muscle stiffness that I’d been dealing with earlier this year. Sometimes it was a stretch to even make it that far, to tell you the truth. Now that I’m doing better physically, I’d like to double that number at bare minimum. If it’s possible, I may even aim for a longer time period than that. I’ll let you know next month. If you’re a fellow meditator, how is it going for you? I woke up feeling stiff and sore one day last week. While I’m not still sure what caused it, it hurt to move my head in certain ways when I got up that morning. A few years ago I experienced a more painful version of this injury after sleeping in an odd position, so this time I didn’t delay in following the home treatments that had worked so well back then. It was better to treat it immediately than to do nothing wait for it to slowly get worse like it did last time. Here’s the problem with this kind of muscle strain: the pain, stiffness, and limited range of motion feed into each other in a cycle that can be tricky to break. The pain made my muscles in my neck and shoulder tense up and spasm. This was even more true in the evening when I was tired and feeling more sore than I had when the day began. My muscles contracting made the strain hurt even more because I didn’t have the full range of motion in that part of my body. Positions that felt good for my muscles could be uncomfortable for my spine, and vice versa. Not having the full range of motion in my neck and shoulder also made it difficult to truly relax. It was hard to turn my head in certain ways, for example, and sleeping in some positions was simply impossible. Consciously trying to relax is also hard to do in this situation because I was so focused on how uncomfortable I was feeling. One of the first things I did for myself after taking some over-the-counter pain relief medication was to find my microwave-actived heating pad. It’s a piece of cloth that’s filled with magical little beads. I don’t know what the beads are made of, but they warm up beautifully and can be wrapped around any sore part of a body. I especially enjoy the gentle pressure that this heating pad provides since sitting or lying in certain positions were simply not happening for me at that point. The medicine and heating pad were temporary fixes, though. What I really needed to do was to break the cycle of tension and pain. 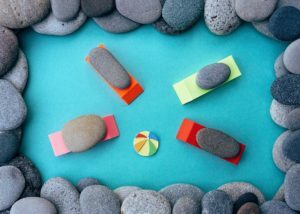 “Body Scan” is a guided meditation program that begins with asking you to focus on your breathing. After you’ve done that for a minute or two, it has you methodically relax every single part of your body beginning with your scalp and working your way down your body until even your toes have gotten some attention. If you feel any sensation in a part of your body, you’re supposed to take note of it without labelling it as good or bad. This is a lot harder to do than you might imagine when the sensation in that area is objectively painful! It is an important part of the process, though. I’d never thought I’d spend so much time thinking about everything from my ears to my fingers to the small of my back, but it really does work if you focus on the speaker’s voice and follow her instructions. This wasn’t a quick fix. With that being said, it did help me to relax some tense muscles that really needed to be soothed. Time is by far the biggest healer of injuries like this, of course, but I also noticed another feedback loop developing that was much more positive than the first one. Every time I meditated, my muscled relaxed a little more than they had in the previous session. As they relaxed, my pain levels dropped even after I cut back or fully stopped using medication and only relied on heating pads for relief. As my pain levels dropped, I was able to move my head in ways that had been difficult the day before. As my range of motion slowly improved again, my muscles spasmed less. I have no idea how – or even if – this would work for more severe or longterm types of pain. It was a nice bit of relief for a temporary injury, though, and I was very grateful for it once I got into the habit of meditating more than once a day during he duration of this injury. How has meditating improved your life lately?